As you saw on Instagram, we recently went with my family to Hawaii to celebrate my dad's 60th birthday. Yes, it was awesome! 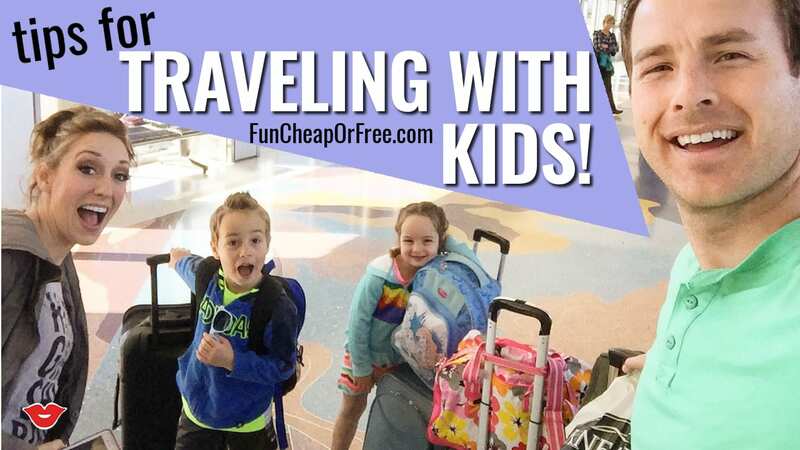 We brought 2 of our 4 kids and I had so many questions about traveling with kids, I decided to do a video to show you how we survived the flights – including a red-eye flight home – with two youngsters in this week's Millennial Moms video! 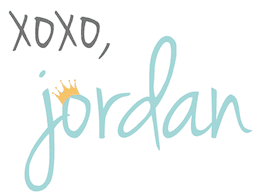 Quick refresher – I upload a new video ever Wednesday to the new YouTube channel, Millennial Moms, and you really should subscribe so you don't miss any of the fun! Then be sure to check out and subscribe to my personal channel, FunCheapOrFree YouTube, to catch Periscopes you might have missed, and to see behind-the-scenes of my life and our new house renovation project! They are young, 15 months and 2 at the time. It was an exhausting trip – no naps, red-eye flights, long days in the sun, crowds, lots of walking…definitely not a trip super conducive to little littles. We have the only grandkids in the family, my brothers haven't had kids yet. So we felt like bringing our entire giant family would slow down everyone else's trip, so it was a bit of a courtesy play to bring only the ones that could carry their own bags, were potty trained, and could handle skipping naps. It's an expensive vacation! We have decided to do “big kid trips” and “whole-family trips”. Hawaii was definitely a big kid trip in this case, but don't you worry, we plan to do several “whole family trips” throughout the year. And no, the littles weren't sad at all! Not even a single tear (which I was slightly sad about…). They only get to see their cousins once or twice per year so it was such a treat for them to be with them for a whole week! They swam, played, and got spoiled rotten. Breaking down the tips for you! No time to watch? No problem! Here's my tips, in a handy-dandy list form so you can read them while you're in the carpool line at school (because we all know that's when we get our reading-time in, right?!). It's expensive (try $50 a bag on our last trip… NO THANKS! ), and you just don't need to! We pack a backpack, tote or the like for each person (with things to entertain, snacks, etc) to go under the seat, and a carry-on suitcase with wheels. Once we get to the gate, we ask if we can gate check them! Then they take our bags away, and once we arrive, they are waiting for us as we exit the plane (and, it's FREE!). It means we don't wait for luggage, and we can get our trip started as soon as we're off the plane! 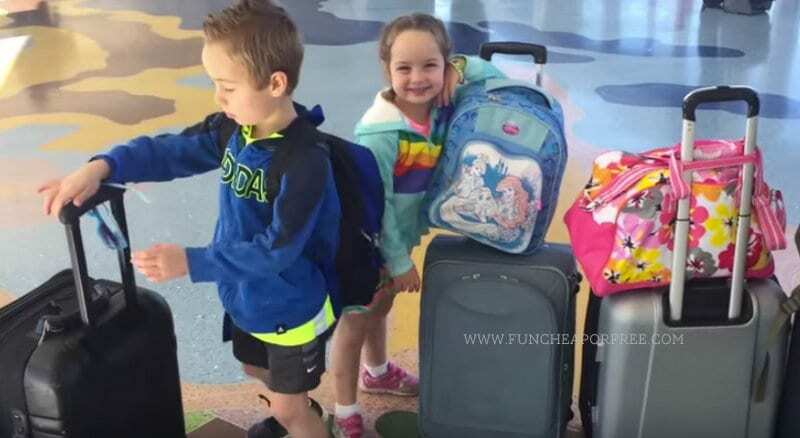 Traveling can be a long, and boring ordeal for kiddos. We pack each of our kids an “Activity Backpack”. Inside these magical backpacks are all sorts of entertainment — coloring books, stickers, a cozy blanket, you name it! Also, not to be forgotten are headphones so they can listen to a movie, music or whatever they want without the entire plane (or car) hearing it too! Invest in a splitter!! What is this magical thing? A way for your kids to SHARE a device, which is a literal miracle. Invest in one of these, and you will thank me later! AND – ask for homework BEFORE your trip, so your kiddo can stay caught up, and not be overloaded with homework when you get home! If your ride, or trip is long — pack a snack bag! We like to fill a gallon-sized bag, per kiddo with his or her favorite snacks. A peanut butter and jelly sandwich, fruit snacks, granola bars, pretzels, an apple, whatever they like. It gives them a variety, and keeps bellies full and happy until you arrive. #SCORE! NOTE – There is a mighty cool trick Bubba can do with an apple. You have to see it to believe it — fast forward to 2:40 to watch my hulk of a husband split an apple in half with his bare hands. Seriously, it's amazing. Our kids are potty trained, and have been for years, but… when they gotta go, they gotta go, and no fasten seatbelt sign is going to change that! 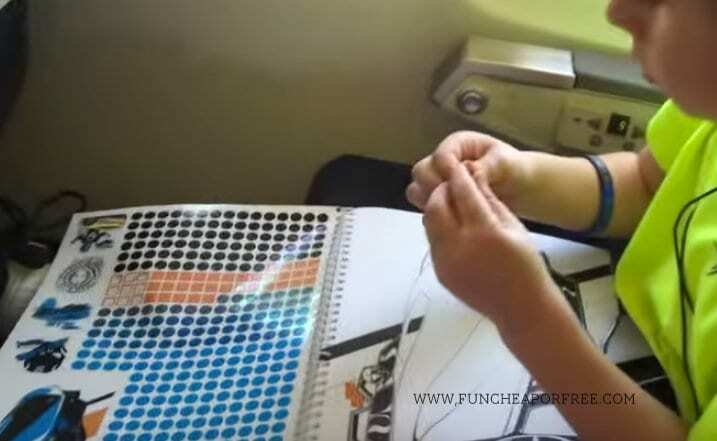 We have them wear a pull-up on the plane, or in the car knowing that we won't have an accident if an emergency strikes. We pack an extra pair of undies too, just in case. When those wonderful drink-carts come through the airplane isle, we don't ask for a cup of apple juice; we ask for the entire can. You are less likely to spill from a can, than a cup if the plane hits some rough air. No sloshes, no spillage, just try tables and kids all around (and more juice, so double win!). Buy your kids a neck pillow! They make it easier for them to snooze in a small space, and keep them from getting slumpy neck (you know, when their chin drops down to their belly button, and you have NO idea how they can even breathe?!). They are comfy, and nice to snuggle when nap time hits. Do you have any go-to tips for traveling with kiddos? Share with me in the comments below!